The actions of the U.S. military elicit the same contempt from Khalid and many ordinary Afghans as the actions of the Taliban or ISIS. Khalid was a little wary when Zuhal, Hoor and I were introduced to him in a ward of Emergency Hospital in Kabul, where he has been recuperating from a U.S. shrapnel injury to his spine that nearly killed him. But, immediately, I saw his care for others. “Please bring a chair for him,” Khalid told his brother, not wanting me to be uncomfortable in squatting next to him, as we began our conversation in the corridor space outside the ward. Having just recovered strength in his legs, he had walked tentatively to the corridor, making sure his urinary catheter bag wasn’t in the way as he sat down. 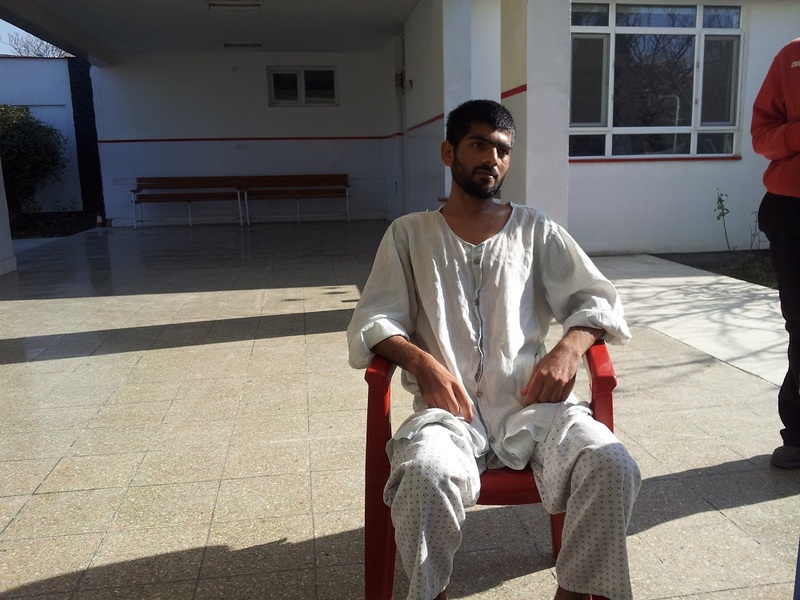 Former MSF Kunduz Hospital pharmacist, Khalid Ahmad, recuperating at Emergency Hospital in Kabul, Afghanistan. The autumn sun revealed tired lines on his face, as if even skin can get permanently traumatized by the shock of bomb blasts. “The Taliban had already taken control of all areas in Kunduz except the MSF Hospital and the airport. I felt I could still serve the patients safely because neither the Afghan /U.S. military forces nor the Taliban would bother us. At least, they’re not supposed to.” Khalid paused imperceptibly. What were those laser-like flashes? Khalid’s eyes cringed a little, disappointment soaking his voice. Such shock can be too much for a human being to bear; irreparable disappointment at the U.S. military for attacking a humanitarian, medical facility, and an unfair guilty disappointment with self for having escaped death while colleagues were killed. I could almost hear his distraught mother wondering what could have happened to her son who should have been safe in the hospital environment. As I struggled emotionally to register Khalid’s story in my mind, I remembered my own training and practice as a doctor in hospitals, and I wished there was a global conversation about the failure of the Geneva Conventions to protect civilians and health facilities. The European Council in Brussels in 2003 estimated that since 1990, almost 4 million people have died in wars, 90% of whom were civilians. A positive way to respond would be to join MSF, as well as ICRC President Peter Maurer and UN Head Ban Ki Moon in saying, “Enough! Even war has rules!” , that is, we can sign MSF’s petition for an #independent investigation of the Kunduz MSF Hospital bombing. Passively accepting the Pentagon’s confessional report of ‘human error’ resulting in the killing of 31 staff and patients in the Kunduz Hospital bombing would allow the U.S. and other militaries to continue breaching laws and conventions with impunity, like in Yemen right now. The International Committee of the Red Cross reported in October that nearly 100 hospitals in Yemen had been attacked since March 2015. Just as recently as 2nd December, Khalid’s haunting story repeated itself in Taiz, Yemen, where an MSF clinic was attacked by the Saudi coalition forces, prompting Karline Kleijer, MSF operational manager for Yemen, to say that every nation backing the Yemen war, including the U.S., must answer for the Yemen MSF clinic bombing. So many possible fatal ‘human errors’ and mistakes…. It struck me from Khalid’s account that the U.S. military could bomb a health facility by what Kate Clark of the Afghan Analysts Network suggested as ‘ripping up the rule book’, and then not take any measures whatsoever after the bombing to treat casualties like Khalid and many others. If you are a civilian bombed by the U.S. military, you’ll have to fend for yourself! Khalid asked why we wanted to take his photograph. His question reminded me of what we as individuals can do: taking and seeing his photo in this article isn’t going to be enough.